The West Florissant Avenue Great Streets Project aims to help re-imagine and transform part of West Florissant Avenue. 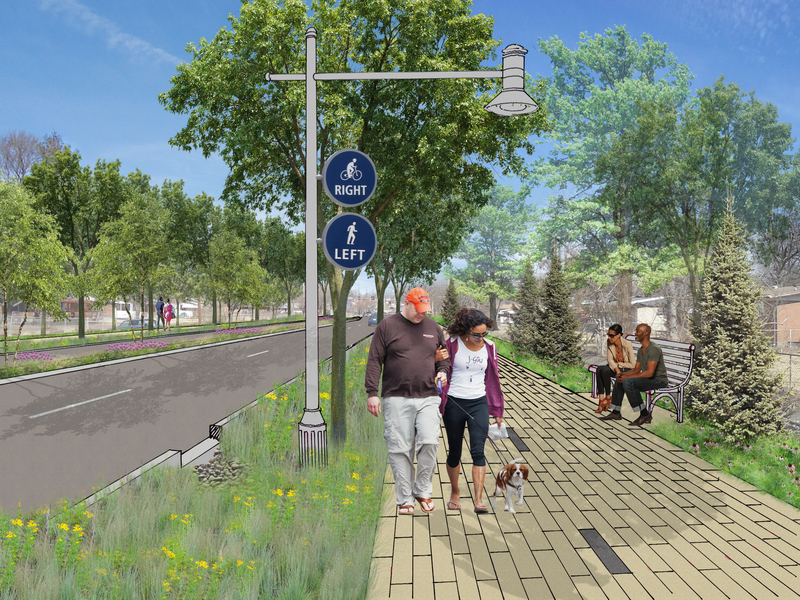 The West Florissant Avenue Great Streets Project aims to help re-imagine and transform part of West Florissant Avenue to create a safe and accessible area for vehicles, pedestrians, bicyclists and transit riders. These improvements will seek to create an attractive sense of place – helping to make West Florrisant Avenue a more desirable place to shop, socialize, travel, and live. Ultimately, the Project also hopes to be catalyst for more community development and improved economic conditions along the corridor. West Florissant Avenue connects neighborhoods, institutions, parks and town center areas with safe and attractive linkages for pedestrians, cyclists, vehicles and transit. The design of the street brings a cohesive image and identity to Dellwood and Ferguson. Civic places and walkable areas define the heart of the community. This Great Street offers a healthy lifestyle not solely dependent on cars, and benefits from rich sustainable landscapes and natural features. The street’s future development is the reflection of strong collaboration among Dellwood, Ferguson and St. Louis County. West Florissant Avenue is a good place to live, work and shop. Ask any of the local small business owners or residents who are proud of their community and they will tell you why it is a strong, resilient and passionate community. However, the negative media attention placed on the corridor has hurt its image. The Project includes a branding and identity component to help create a sense of place of which residents and business owners can be proud, and which will help encourage more visitors and investment along the corridor. The community will play an important role in developing a strong brand and identity for West Florissant Avenue. It’s not easy to get around large, wide streets that were designed for cars. Roadways like West Florissant Avenue were built at a time when people did not think about walking from shop to shop, or riding your bike down to the market. Walking and biking along West Florissant today is often difficult, which does not encourage people to walk to visit their neighbors and shops down the street. The Project will design and create the necessary improvements that make it more connected, safe and accessible for all users. The Project wants to catalyze economic and community development opportunities for the area business community and surrounding neighborhoods. The Project is part of the Saint Louis Great Streets Initiative that has helped transform other regional corridors such as South Grand Avenue, Natural Bridge Avenue, and Page Avenue. The start of construction on Segments 3, 4, and 5 depends on funding. The Project team is preparing to be able to apply for federal funding as soon as applications are accepted. We are committed to making this vision a reality. The West Florissant Avenue Great Streets Project has currently received funding to design improvements on West Florissant Avenue from the Norfolk Southern Railroad in the south to Stein Avenue in the north. This part of the Project is called the Preliminary Design phase and will run until late 2017. The West Florissant Avenue Great Streets Master Plan, completed in June 2014, provided a vision for the Project thanks to community feedback. According to the Master Plan, Project construction will cost upwards of $33 million. Right now, we have $2.5 million dedicated to this Phase for Preliminary Design, which involves concept refinement, conceptual estimating, data collection, topographical and boundary surveys, geotechnical studies, utility coordination, community engagement, and design work among other tasks. This work is required before the project can be funded or built. The Project is sponsored by St. Louis County Department of Transportation and East-West Gateway Council of Governments (St. Louis’ regional planning organization), in partnership with the Cities of Dellwood and Ferguson. West Florissant Avenue is maintained by St. Louis County.